Coca was regarded favorably in treating drug addictions involving physical withdrawal and debility (i.e. malnutrition and bodily metabolism), a stance advocated on both sides of the Atlantic. W.H. Bentley, a Medical Doctor practicing in Oak Valley, Kentucky, authored the September 15, 1880 Therapeutic Gazette article "Erythroxloyn Coca and the Opium and Alcohol Habits" - an account of about half a dozen patients who relieved of their habit by drinking Coca preparations. 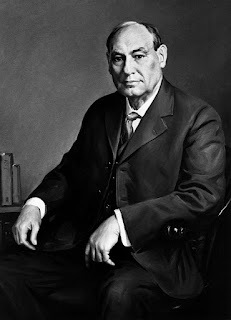 Bentley was not alone in his findings, in the U.S. nor abroad, with numerous reports of this efficacy appearing regularly in The Therapeutic Gazette as well as the Philadelphia Medical Times, New Remedies, Medical and Surgical Reporter, and New York Medical Record, and elsewhere. Remember this was with Coca preparations, containing a low concentrations of cocaine alkaloid, akin to that customary for the alkaloid caffeine in Coffee and Tea, or the alkaloid nicotine in Tobacco. This was not the 100 X more potent use of isolated cocaine in the highly concentrated direct doses made possible with injections. "M. X....., barrister, 32 years of age, five years ago began to use morphine preparations as a remedy against a very alarming chronic bronchitis and granulation in the throat which were irritated constantly by cigarette smoking." "the patient at first only used morphine, but his physician committed the imprudence of treating him by hypodermic injection. 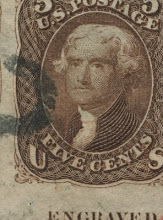 A noticeable change for the better was produced during the first month, but unfortunately, abuse succeeded promptly the use of the medicament-- so much that when I commenced to treat the patient, he was taking daily from 1 gramme 50 centigrams to 1 gramme 80 centigrammes of morphine hypodermically. When he was four hours without his dose there appeared insomnia, hallucinations and delirium; constipation lasting sometimes for fifteen days, which brought on in the spring a very alarming perityplitis, jerking of the muscles, sudden frights, dyspepsia, and at last frightful congestion of the face whenever he drank a drop of wine or brandy. "After a month's treatment I had succeeded in reducing the daily doses without causing alarming symptoms; the physiological functions seemed to awaken again. however, the congestion and especially the dyspepsia was very grave, and the cough which had been suppressed by morphine returned. It was then that I treated my patient with phosphate of lime, the pate and the . Lacking his habitual stimulant, he was plunged in a semi-coma from which he could not always be relieved with weaker daily doses of morphine. . . The danger I feared most was a relapse of bronchitis, and that the cough and expectoration might end fatally. But in about a week, during which he took ten doses of Pate de Coca daily, the cough became less fatiguing and disappeared entirely in about twenty days. The patient than commenced to take small doses of (two Mandeira-glasses a day). At first congestion appeared, but little by little, as digestion became more easy, my patient, who on account of his profound anemia could not tolerate any table wines, took at first a small glass, than two, than three glasses at a meal. Now he can go and take dinner in town, which he had not been able to do for three years; he regained his former vigor, is able to undertake anew his occupations, and has entirely given up his morphine habit." "Coca has been used with great success in the treatment of the opium habit, it is also an excellent substitute for Tobacco [emphasis added]. It has been successfully used in dyspepsia, flatulency, colic, gastralgia, enteralgia, hysteria, hypochondria, spinal irritation, idiopathic convulsions , nervous erethism, and in the debility following severe acute affections. As it is a valuable restorative agent, checking tissue-waste, it is also a useful remedy in consumption [?] and wasting diseases generally. It is also of value in the nervous forms of sick-headache, migraine. It is also said to be an aphrodisiac." Personally, I have found the effect of smoking coca leaves to bear out the statement that the drug produces a general excitation of the circulatory and nervous systems. Smoking and inhaling the smoke of one or two cigars will increase my own pulse rate some eight or ten beats to the minute. It certainly relieves the scene of fatigue. Smoked at night, in my own case and in the cases of several of my patients, it produces wakefulness similar to strong coffee. The exaltation produced by it does not seem to be followed by any feeling of languor or depression. I find it a relief after a full meal, like a good tobacco cigar. It seems to impart increased vigor to the muscular system as well to the intellect, with an indescribable feeling of satisfaction. I have never experienced any intoxicating effects from smoking it. Dr. Bartholow says that coca, as in the case with tea and coffee, acts as an indirect nutrient by checking waste, and hence a less amount of food is necessary to maintain the bodily functions; and as I have just learned, in a letter from Messrs. Parke, Davis and Company, that "a Mr. Stevens, a citizen of Abilene, Kansas, who was afflicted with hay fever, and was about to go to the mountains, has concluded to remain at home, having obtained relief from the use of cigarettes of coca. Every morning he uses a cigarette and perfect relief. He uses three per day. Information on Coca leaf smokables, their history and decline is rare- for records showing sales or later accounts are generally inaccessible. As these even included a pipe mixture, described in its day with the misnomer as a "smoking Tobacco", Coca leaf smoking presented some interesting parallels, for one the possibility they were a more benign substitute to smoke then Tobacco. Among “chewers” of these respective agricultural commodities, oral cancer is common with those using Tobacco, yet its rare among chewers of Coca. 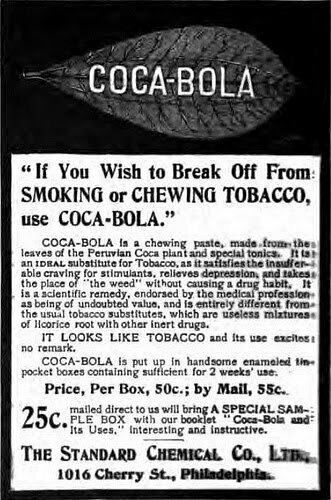 Given that these Coca leaf smokables were introduced only 30 years before Coca was banned by U.S. statute by the 1914 Harrison Act, they have less of a history to be fully aware of their long term chronic effects. Nor does it appear that this has been a topic of any study- baring any possible secret research, much like the cigarette companies' purported non-study of the pharmacological properties of nicotine. I addition to smokable coca leaf, we had coca based extract and chewing gums, respectively used for treating alcoholism and the tobacco habit. … in the fourth and fifth classes I desire to recommend the administration of Erythroxylon Coca. It is useless in the treatment of delirium tremens, but to relieve the depression resulting from the deprival of stimulants it has remarkable powers. Its effects in relieving one from the sense of fatigue are too well known to require more than a passing notice. I have frequently returned to my home after a hard day’s work only to find that a still harder night awaited me in the shape of a tenuous labor case. A dose of coca, however, removed the fatigue and left me as fresh as when starting out in the morning after a sound night’s sleep. This case was cured and the cure has remained for five years without a relapse. In repeating this experiment I found an obstacle in the fact that men did not like to be seen taking medicine. They could not be induced to carry a bottle and spoon around with them and withstand the badinage of their companions. Beside, the liquid preparations of coca contain alcohol, and I may say here, that in all experiments with coca, it is necessary to exclude carefully the effect of alcohol, which obscures and often counteracts the effect of the remedy.